As Native Instruments celebrate their 10th anniversary we go behind the scenes at the company, remember the highlights, and look forward to the next decade in software instrument design. It's the early '90s, and hardware engineer Stephan Schmitt is taking a vacation from his job developing mixing consoles. At the house where he is staying, the only reading matter is a copy of the German computer technology magazine c't. Stephan also has his Yamaha DX7-II with him — a synthesizer with a notoriously difficult user interface. "When I was reading about this PC stuff, for me the picture somehow became clear that the PC is a very good platform to build synthesizers on," remembers Stephan, NI's founder and President. "The main advantage of a computer of course is its screen and its input/output abilities." Other organisations such as Ariel/IRCAM and Symbolic Sound were already experimenting with computer-based synthesis, but their implementations required expensive DSP cards. "I was thinking about something similar, but on simple cheap PCs, with cards as cheap as possible, but in the end the cheapest solution was to create a software-only system. I wanted to bring the stuff that was established only in the academic field to everybody, or people like me." When Stephan found himself unemployed shortly afterwards, it was a perfect opportunity to try to realise his vision of a software synth. Stephan teamed up with self-taught programmer Volker Hinz, and they drew up the plans for a modular synth environment. Generator allowed the user to construct instruments from low-level modules — oscillators, filters and so on — connected together in a graphical interface. It was, in other words, the embryo of Reaktor. The pair, calling themselves Native Instruments, caused a storm at the 1996 Musikmesse in Frankfurt when they showed the results of their efforts. Generator attracted a tide of talent hoping to be involved in this new direction for musical instruments, despite the fact that there was initially no money to pay salaries. 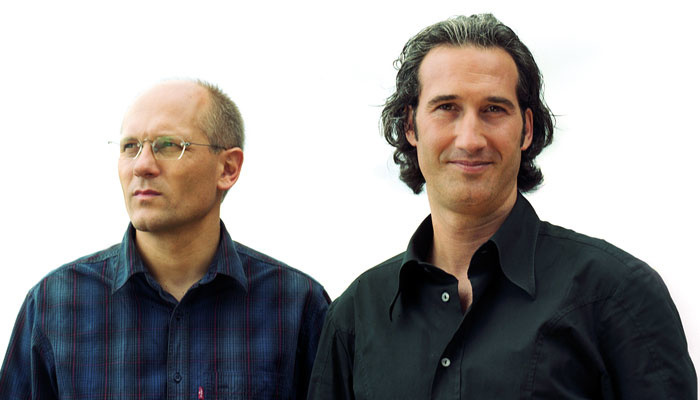 One of the new faces, Bernd Roggendorf (who later went on to found Ableton), was a close friend of present-day CEO Daniel Haver. Bernd encouraged Daniel to bring his business acumen and drive to the group, which until then consisted entirely of engineers. With Daniel aboard, the enterprise gained strong organisational and procedural foundations, worldwide distribution partnerships, and a charismatic advocate. "Generator was creating such a great sound, so I imagined that this thing would be able to influence the music that I listened to," says Daniel. "At the same time I saw the huge commercial potential." The partnership between Stephan and Daniel worked unusually well, partly because there was little risk of either stepping on the other's toes. Daniel explains: "The success started because of a lack of capabilities on both sides. I had no clue about software synthesis, I wasn't an engineer, and I'm rarely a musician, so I could not add much to the technology side of things, but I think I'm quite a good businessman, and I'm passionate about what I do. Stephan did not have the capabilities of a businessman, but was a visionary, an engineer, and musician. I could completely agree to his vision, and that's what brought us together. Bernd was kind of a mediator because he was my best friend so I trusted him, and Stephan trusted in Bernd as an engineer and then also as a person, so Bernd allowed us to put some trust in each other. That is exactly what mostly doesn't happen; engineers tend not to trust in businessmen, and the other way around, when it comes to the big picture." Our birthday visit to Native Instruments' HQ happened to coincide with the unveiling of a major new product, and NI were kind enough to give us an exclusive peek at their newest baby. 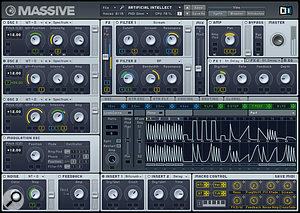 Massive is a brand-new synth designed by Mike Daliot, who created the classic Reaktor instruments Carbon and Vierring, as well the inspired Metaphysical Function and Photone from the Electronic Instruments II collection. His concept was to create a stand-alone synth that was straightforward to use, but had the same kind of intensity and depth as his instruments in Reaktor. The result is a semi-modular subtractive synth, with three wavetable oscillators, and multiple envelope and step sequence modulation options. Everything is presented in one screen, with a clever drag-and-drop assignment system for modulation and control, and a routing page with click boxes for changing the signal flow. The synth features very high sample-rate processing throughout, high-frequency modulation sources and multiple internal saturation stages. NI see Massive as performing a similar role to synths like the Nord Lead or Access Virus, as it's capable of some really rich, clear and analoguesque sounds. Massive Product Manager Frank Elting.Photo: Ingo Kniest One of the goals of the synth was to take advantage of newer, faster CPUs to push the boundaries of how good the sound could be, and how close to analogue they could get. "We tried to come as close as possible to the prototypes in Reaktor in the C++ engine," Product Manager Frank Elting explains, "and we transferred all the oversampling things we did in Reaktor to the engine. If possible we wanted to get the Reaktor pure sound, without too many thoughts of CPU consumption." This meant using high sample rates both at the sound-generation stage and the envelope and modulation stages. The result is an amazing depth and clarity, and a huge range over which sounds can be swept and modulated without digital artifacts. 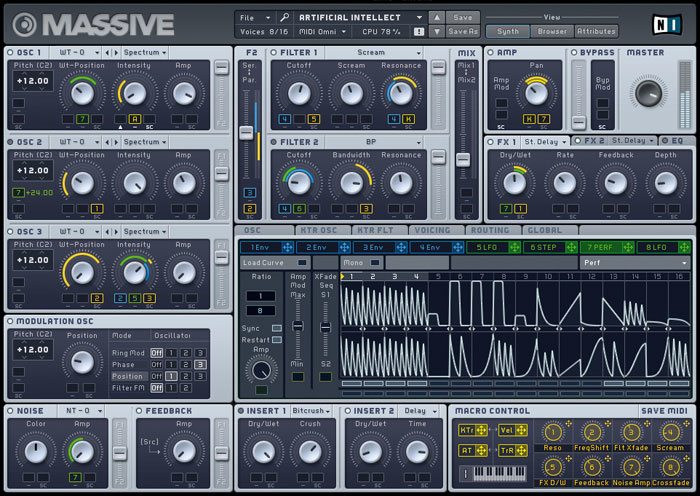 As well as checking out the synth, which we'll be reviewing in full soon, I was interested to find out how a product like Massive is developed. Sascha Kubiak, Head of Synth and Host Line / Instruments Division, explains: "Our synth portfolio was growing, but we wanted to have a new massive synthesizer, something which makes huge leads and bass sounds. It's possible to make these with others of our synths, but we wanted to have one dedicated for this, with extraordinary sound quality, on top of the technology level which is there right now, as computers are getting faster and you can use more processor power. Then we had to think 'Can we do it with our resources? '; it's not only about programmers but about people who do the concepts as well, the product designers." Frank Elting: "There was the idea of a new synthesizer a long time ago, and it went through many iteration stages. Then Mike came up with the concept — originally it was very different — and again many opinions and iteration stages came in and together formed this product. Then, in the development process the product still changes. Parts of the engine were prototyped in Reaktor." NI's forthcoming Massive soft synth is, well, massive... Throughout the development process, the design was still open to change based on new ideas, feature requests, and how the sound and usability turn out. "I think we changed how we select and change master effects five times, just to get an optimal workflow and visual feedback." As the Product Manager, Frank had quite a job juggling all the things to do with the resources and time available. The programming team wrote certain aspects from scratch, while the modules that had been prototyped in Reaktor had to be optimised and translated into C++. Graphic designers also got involved at an early stage, reflecting NI's increasing focus on usability. A core application programmer developed the main shell, and other sections were coded separately. "It's kind of modular," says Frank. "The oscillator section is separate from the filter section, all the master effects are different modules that are simply plugged into the application." Eventually, after all the programming, experiments and changes, an alpha version of the instrument could be thoroughly tested to make sure all the modules worked together properly. It's not until the beta version that a synth becomes a plug-in and not just a stand-alone application. "We have a framework which adapts the application to every plug-in format we support. This framework took years to build and to optimise." As well as overseeing all this, the Product Manager needs to take care of getting the manual written, and work with sound designers, making sure that they understand the new synth so they can create patches that really use all the aspects of the new instrument. Beta-testing must be co-ordinated, and bug fixes prioritised. Marketing and web material must be prepared, which starts with the packaging design. Eventually, the product can be let out into the wild, and the team can see how their efforts are received by the public. Generator continued to grow more advanced, sample-based modules were developed and the technology was split across several products such as Transformator. Eventually, though, everything converged to a single Reaktor package, which remains at the heart of the NI line-up and is now at version 5. Reaktor can be moulded for almost any purpose: it can be a synth, a sampler, an effects unit, a drum machine, a sequencer, or any imaginable combination of these. Not only that, the building blocks are at a low component level, so you can actually build devices from the ground up. It might seem, then, that Reaktor is the ideal platform upon which to build and sell other instruments. This idea can be seen in the releases of the Electronic Instruments I and II packages, which consist of professionally developed Reaktor instruments and effects; and Reaktor is also used to prototype other NI products (see boxes). However, NI soon found that the one-size-fits-all approach didn't meet everyone's needs. Stephan Schmitt: "We started with Generator, and later Reaktor, where we had the idea that this can maybe fulfil all needs of electronic music, like a platform where you can build any kind of instrument or effect, and even sequencers. We tried to make everybody happy with this one product. Then we learned that, OK, we have to think more in traditional schemes, and bring say the vintage stuff, or the well-known instruments to people." 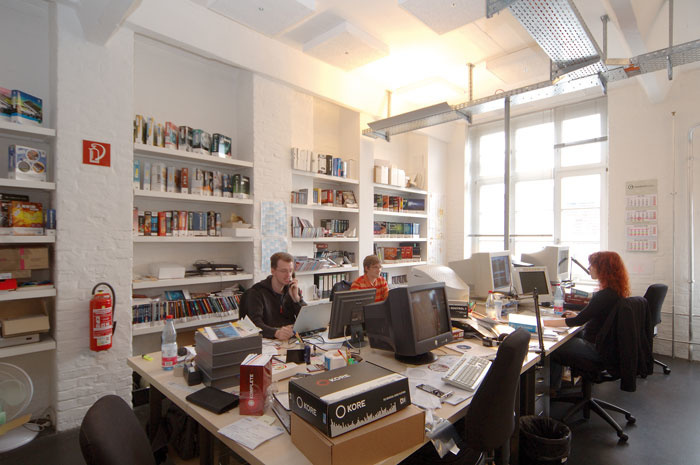 This was 1999, and NI decided to expand both their product range and their business, using venture capital investment to hire more staff and move to the large building they now occupy in Berlin's hip Kreuzburg district. The first fruits of this new growth spurt were 2000's B4 and Pro 5: emulations of the B3 organ and Prophet 5 analogue synth. NI's intuition had been correct, and the familiar interfaces and sounds of these instruments proved hugely popular in a much larger circle of music makers than the Reaktor 'tweakheads'. NI's growth and product release schedule has continued at a gallop for the last five years. FM7 proved the point of soft synths by recreating the DX7 synths with a much friendlier interface. Absynth explored new synthesis possibilities, combining various approaches including granular synthesis with flexible multi-stage envelopes and modulators to make a unique and beautiful instrument. 2002 brought the Kontakt sampler and Battery drum sampler. Unsurprisingly, given its heritage, Kontakt has a semi-modular interface, and has lent some of its interface ideas to Guitar Rig, and then Kore. NI became convinced that the same revolution in synthesis could be applied to other areas of music creation and performance. The first step into a new territory was the DJ tool Traktor. The idea was to make it possible to perform a DJ set from a laptop, using audio files instead of records and CDs. Traktor took hold, and has grown into the sophisticated Traktor DJ Studio 3, complete with four playback decks, automatic beat-matching capabilities, and an emulation of the Allen & Heath Xone 92 mixer. This was not the only collaboration with third parties in the DJ world. A special version of the software (Traktor FS) became the front-end software for the ingenious Stanton Final Scratch system, which uses real turntables and timecode-imprinted records to control playback in software. NI also formed a partnership with the Beatport on-line dance music store, and added an integrated portal in the software so that tracks on Beatport can be previewed and downloaded even while you're playing back a mix. The third area that NI have branched into is multi-effects systems aimed predominately at guitar players. Guitar Rig was a departure in two respects. Not only did it break away from NI's traditional association with electronic music, but it was also their first serious move into hardware development with the Rig Kontrol. True to NI's philosophy of using the ever-increasing native power of standard PCs for sound creation and effects, Rig Kontrol (and later Rig Kontrol 2 and Kore) has no DSP or other capabilities that could limit future developments. "The concept is that the hardware must be as dumb as possible, but as precise as possible," explains Chief Technoloy Officer Michael Hirsch. "The routing, parameter assignments, and what the display and the LEDs are doing are all purely controlled by software. It makes no sense to split the intelligence." 1995: Stephan Schmitt has the idea of making a software synth that can run on cheap off-the-shelf PCs. 1996: Modular soft synth creation system Generator 1.0 released. 1997: Native Instruments GmbH founded with six shareholders, with Daniel Haver as MD. 1998: System split into Generator (synthesis) and Transformator (sampling). A combined solution is christened Reaktor. 1999: Riding the wave of the late '90s tech boom, NI use venture-capital money to grow and develop new instruments. 2000: B4 and Pro 5, Reaktor 2, Pro 52 released. 2001: FM7, Absynth, Reaktor 3, Traktor released. 2002: US division and offices open. Kontakt, Electronic Instruments, Battery released. 2003: Pro 53, Vokator, Reaktor 4, Absynth 2, Komplete 1, Traktor FS released. 2004: Guitar Rig, Electronic Instruments 2, Battery 2, Komplete 2, Elektrik Piano released. 2005: Kontakt 2, Reaktor 5, Guitar Rig 2, Komplete 3, Akoustic Piano released. 2006: Company restructures into three divisions: Instruments, DJ and Guitar. Kore, Audio Kontrol 1, Traktor DJ Studio 3, Massive, FM8, Battery 3, Absynth 4 and so on released. By 2003, NI had a diverse range of products on the market, and some kind of integration was becoming necessary. The first Komplete bundle provided a discounted way to get into the instrument suite, and the Komplete Care subscription scheme ensured users were automatically sent all updates for an annual discounted fee. However, the problem wasn't just updates: the actual process of making music was becoming too complicated, with so many different instruments to choose from, all with their own individual user interfaces. "It should be more about interfacing and making music than administration and learning stuff," says NI Product Designer Mate Galic, one of the leading lights at NI, who's spent much of the last couple of years considering these issues. "I truly believe that you can get lost in making music with computers if you have the right interface for it." NI's first step towards a solution is Kore, which is their first product to act as a plug-in host. 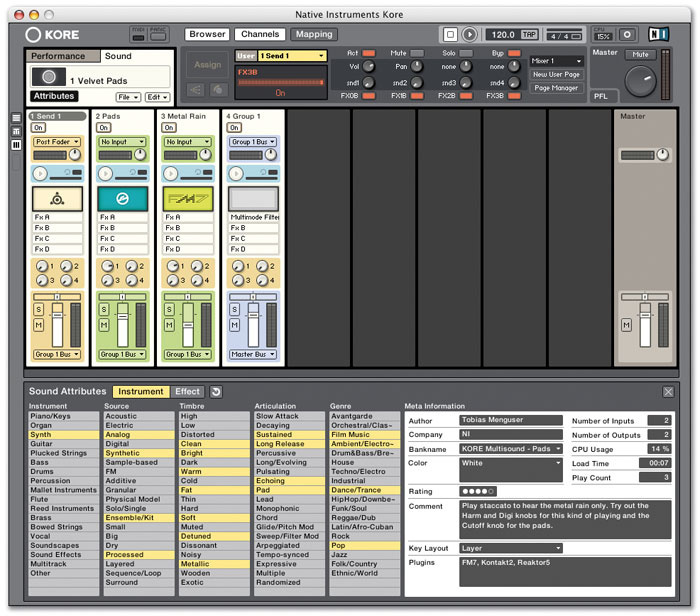 Kore, which itself can run as a plug-in, acts as an intermediary between you and your software instruments. The hardware and host shell give you a uniform control interface, while the Kore Sound browser means that you can search for sound sources by the type of sound, rather than the specific plug-in that produces it. Kore is at the heart of Native Instruments' strategy for the future.It seems the initial release of Kore is just the start of the project. Everyone at NI seems to be itching to take it to the next level, which will see more and more integration between software and hardware. The problem with controllers up till now has been that the hardware is made for existing software, and the results are nearly always disappointing. Now that NI have both sides of the equation, they can concentrate on designing software interfaces that dovetail intuitively into the hardware and host side. "Every release will consider Kore, and Kore itself will consider not only our instruments, but will also third-party manufacturers' instruments and effects," promises Daniel Haver. This is evident in both the new synth Massive (see box on first page of this article) which has eight macro controls right on the front panel ready for Kore control, and also in all the new updates that have just been announced. The Kore-style sound browser is present in each, with the ability to search by sound types and categories. The NI libraries are becoming unified into a single Kore Sound library, so saving a patch in Absynth 4, for example, will result in a file that can be read both by Kore, and the stand-alone application. With Kore in place, NI believe they have the foundation for the next 10 years. Considering future developments, Stephan Schmitt states "I think there will not be so much innovation in the field of how sound is created. The interesting thing is now the user interface: how you can touch sounds, how you can morph or change them." An example of this can be seen on FM8, which lets you load four presets and morph between them from the controller, exploring new sounds without learning how to program the synth from scratch. Potential also lies in the steady rise of computing power. With Massive, for example, NI have chosen to build a synth that's unshackled from previous compromises and optimisations that limit sound quality. So, do NI plan to further explore the hosting business, with more sequencing, recording, or mixing functionality? "One thing is for sure," answers Daniel Haver, "we are a sound company. The approach we took for Kore to make it what it is was the angle of sound. We've got into the domain of host software, the domain of hardware interfaces, controllers and soundcards, but whatever we're going to do it's crucial to us that you can feel the sound and feel the angle that we took. So while maybe a sequencer company would always come from the point of view of composition and notes, and then get into sound, our view is always from the sound and then to other things." As well as being one of NI's flagship products, and the descendant of their original software release, Reaktor is an extremely useful tool for the company when designing and developing new synths. Synths and effects can be mocked up in Reaktor before being coded later in C++. "It's our prototyping platform for nearly everything that we do," explains Stephan. "The DSP, and sometimes also the GUI and control panels, are created and prototyped in Reaktor, and can be discussed and listened to. So we listened to the Guitar Rig amps before any line of code had been written because Michael [Kurz] did them in Reaktor. So it's a product that is very well used in-house. But it's not the core of other products, which is sometimes a misunderstanding." 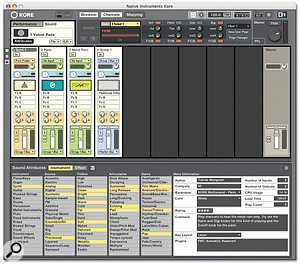 Reaktor was also used extensively for testing concepts for the new Massive synth, as Product Manager Frank Elting explains: "We did different versions of the oscillator model, to decide by ear about the different downsampling algorithms, and to see at which sample rates we needed to run at each stage for the quality we wanted. The wavetables were also created in a Reaktor Ensemble, where we could pre-listen to a combination of the wavetables and single waves. There's no way to do it faster for us!" Native Instruments have grown from two to 130 people in just 10 years. This sort of growth is a fantastic business achievement, but it can often be problematic for companies as they change from a small enthusiastic group to a more corporate entity. NI appear to have been able to develop mature business structures and procedures without becoming stuffy and losing the feeling of engagement among the personnel. There is still a sense in the company of being involved in something exciting and cutting-edge. It helps that many of the original core people are still there and actively involved. Also, of course, most of the NI people are musicians or into music made with the gear, and have gravitated towards the company for that reason. Around the HQ, you don't see the kind of irreverence and nerd humour you often find in American software houses. The NI crew are quite serious about their work, but they clearly aren't just there to pay the bills, and the original spirit of the company is still present. "Stephan and I really want to capture this spirit," says Daniel Haver, "because it's a big portion of not only feeling well to work here but also of innovation and ideas, because they come from everywhere. And by keeping some kind of spirit we allow people still to add more value than maybe their job description would require." Part of that spirit is the revolutionary nature of soft synths, despite the fact that after only 10 years you might say that the likes of NI and Propellerhead are the new establishment. Synthesis Technology Director, Michael Kurz: "We started off as a bunch of freaks with new ideas of doing things, a bit anti-establishment. Generator was a product idea for liberating the synthesizer user from the big manufacturer. Before, it was a big company in Japan that made the chips and you could take it or leave it. Generator was empowerment for the musician: if you don't like the synth, OK: change it, build your own and share it with other users." So have they achieved their goals for the first 10 years? 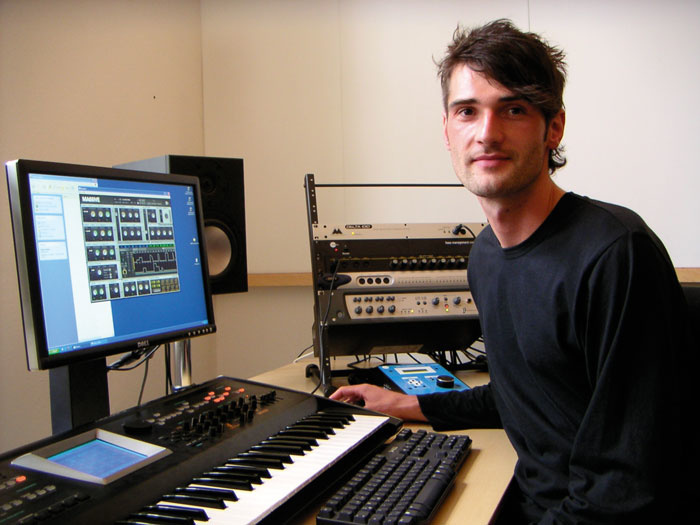 Daniel Haver has the last word: "When I started to work with Native Instruments I was such a passionate listener to all this electronic music stuff. I had all these CDs and I was like 'If some of these artists would ever use our stuff to make their music a little different, better, or whatever, I'd love to see that happen.' And actually, I think at least every second CD that I had, the artist is now using something that we created, and that's exactly what I wanted."